George Andrew Hendrick, Jr. (born October 18, 1949) is a former major league outfielder for the Oakland Athletics, Cleveland Indians, San Diego Padres, Pittsburgh Pirates and California Angels. 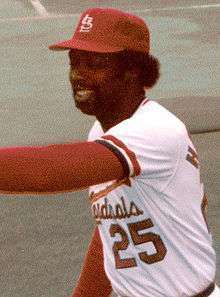 Hendrick is arguably best remembered as a member of the St. Louis Cardinals, for whom he played from 1978 to 1984 and was a key player in the team's 1982 World Series win. He led the Cardinals in home runs every year from 1980 through 1983. Hendrick is currently the special advisor to baseball operations for the Tampa Bay Rays. Over eighteen seasons, Hendrick posted a .278 batting average with 267 home runs and 1111 RBI. His career stats included 941 runs, 1980 hits, 343 doubles, 59 stolen bases, and a .329 on-base percentage in 7129 at-bats. Hendrick began his baseball career in the minor leagues with Burlington in 1968, leading the league with a .327 batting average and 25 doubles. He was an all-star four times, twice with Cleveland in 1974 and 1975 and twice with St. Louis in 1980 and 1983, and finished in the top 15 in league MVP voting four consecutive years between 1980 and 1983. Hendrick was one of the first players to hit 100 home runs in each league, 150 for the National League and 117 for the American League. He was the first MLB player to wear his pant legs down to his ankles, was nicknamed "Jogging George" and "Captain Easy" because of his reputation for not running plays out or giving 100% effort and "Silent George" due to his longstanding policy of not talking to the media. Besides, Angels beat reporter Lisa Nehus Saxon, one of the first women to cover a MLB team, credited Hendrick for protecting her from Reggie Jackson's harassment and verbal abuse. In between, Hendrick played winter ball with the Cangrejeros de Santurce club of the Puerto Rico League, where he won the batting title in the 1973–1974 tournament. He also played for the Gold Coast Suns of the Senior Professional Baseball Association in its 1989 inaugural season. On March 24, 1973, the Oakland A's traded Hendrick, with catcher Dave Duncan, to the Cleveland Indians for catcher Ray Fosse and shortstop Jack Heidemann. On December 8, 1976, the Indians traded him to the San Diego Padres for outfielder John Grubb, catcher Fred Kendall, and infielder Héctor Torres. On May 26, 1978, the Padres traded Hendrick to the St. Louis Cardinals for pitcher Eric Rasmussen. On December 12, 1984, the Cardinals traded him, with catcher Steve Barnard, to the Pittsburgh Pirates for pitcher John Tudor and outfielder Brian Harper. On August 2, 1985, the Pirates traded Hendrick, along with pitchers John Candelaria and Al Holland, to the California Angels for infielder Mike Brown, pitcher Pat Clements and a player to be named later (Bob Kipper). Hendrick began his coaching career with the Cardinals as a minor league hitting/outfield instructor from 1993 to 1995 before becoming the hitting coach of the big league club from 1996 to 1997. After leaving the Cardinals, he worked as coach at various levels in the California Angels and Los Angeles Dodgers systems from 1998 to 2005. 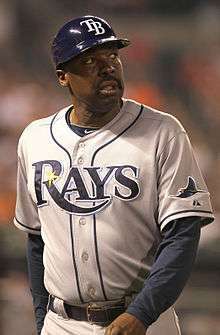 On November 21, 2005, Hendrick was named as a first base/outfield coach for Tampa Bay, a position he held through the end of the 2014 season. He then became Special Advisor to Baseball Operations for the Rays. His son, Brian, played college basketball for the California Golden Bears. ↑ Jim Tommey and Kip Ingle, ed. (1987). St. Louis Cardinals 1987 Media Guide. St. Louis National Baseball Club. p. 153. ↑ "George Hendrick". baseball-almanac.com. Retrieved 2013-01-06. ↑ Cardinals' Media Relations, ed. (2001). St. Louis Cardinals 2001 Media Guide. Hadler Printing Company. pp. A–163. ↑ "George Hendrick Baseball Stats". baseball-almanac.com. Retrieved 2011-02-23. ↑ 1972 Topps Baseball Card. Hardball Times. Retrieved on March 2, 2016. ↑ "Hendrick Having A Quiet Impact". The Las Vegas Sun. May 2, 2003. Retrieved 23 February 2011. ↑ Ross, Jack. "Lisa Saxon: the Women Who Helped Change Sports Writing Forever". Vice Sports. Retrieved 2 December 2014. ↑ Campeones de bateo Liga Puerto Rico. Beisbol 007. Retrieved on March 2, 2016. ↑ Phillips, Darell (29 March 1973). "Was trade a good one?". The Modesto Bee. p. C3. Retrieved 7 June 2010. ↑ "George Henrick Trades and Transactions". baseball-almanac.com. Retrieved 2011-02-23. ↑ "NCAA Midwest Notebook". The Maidson Courier. Associated Press. March 25, 1993. p. B1. Retrieved February 28, 2012.